Tiny bluish-green succulent leaves are held tight against deep red stems, with white flowers appearing in late summer. Foliage reaches 1-3" and turns scarlet-purple in winter. 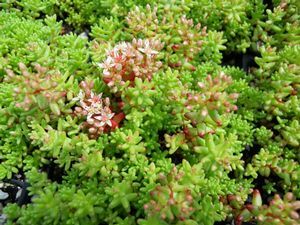 This stonecrop is a popular choice for green roof mixes as it will mingle nicely with other low growing succulents, is drought tolerant and fill in quickly.